TradeStation is best known for offering a professional-grade, top notch trading platform with world class analytics software that targets active and experienced traders seeking to build, test, analyze, monitor and even automate custom stock, options and futures trading strategies. Like thinkorswim®, TradeStation was founded by traders for traders; Bill and Ralph Cruz founded TradeStation for the purpose of automating their own trading strategies. 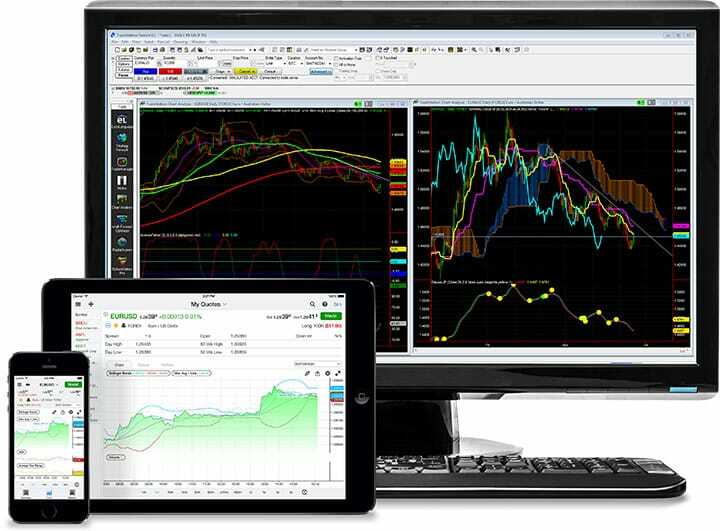 And like thinkorswim®, the TradeStation trading platform is enormously powerful, serving both institutional customers as well as active retail traders, and featuring advanced customizable charting, back-testing and analysis capabilities. TradeStation trading platform is high-powered, customizable, and targets experienced and active traders. TradeStation rewards highly active equities and options traders with rates as low as $5 per trade. For options traders seeking to execute simple strategies like Covered Calls, Married Puts and Collar Trades and advanced options strategies, such as Iron Butterfly, Ratio Backspread and Combination Spreads, TradeStation has full order execution capability. Professional-grade features that cater to experienced, data-driven traders, technology buffs and institutions may be intimidating to new traders, who might prefer a simpler trading platform to begin. Long-term, buy-and-hold investors should pay heed to the high monthly platform fee of $99.95 if certain minimums are not met. TradeStation has extensive research capabilities, fast and accurate order execution, a customizable trading platform supporting third party development using EasyLanguage but is costly to non-active traders and intimidating to new traders. ✅ Professional-grade Platform: TradeStation allows tech-savvy traders to develop customizable strategies using third party development using EasyLanguage. It provides highly advanced tools and charting capabilities as well as advanced back-testing features. Tools include Radar Screen, Scanner Matrix and Walk-forward Optimizer. ❌ Costly For Less Active Traders: TradeStation has a monthly fee of $99.95 which is waived for active traders, who execute equities trades of at least 5,000 shares monthly and for options traders trading at least 50 contracts per month. ✅ Extensive Research & Education: Tradestation has advanced research capabilities to back-test strategies plus TradeStation University has video tutorials on getting up to speed on the Tradestation platform as well as strategy trading, EasyLanguage and trading books. ❌ Commission-free ETFs: TradeStation has no commission-free ETFs available. ✅ Trading AppStore: TradeStation allows customers to develop trading apps via its own app store that can be sold to other customers. ❌ Real-time Data Costs: For real-time S&P 500, NASDAQ, Dow Jones, Chicago Mercantile Exchange quotes, TradeStations charges a monthly fee that can be as high as $105. ✅ Fast & Accurate Order Execution: Active, experienced traders who want and need fast and accurate order execution will find TradeStation’s professional-trade trading platform delivers as expected. TradeStation has a complex fee structure that’s a puzzle to figure out. TradeStation is ideal for active and technology-savvy traders who want a world class trading platform with professional-grade features, extensive research, advanced tools, and customizable trading strategies. Active traders are rewarded with significantly discounted commissions and fees. Less active traders and new traders may find the platform more costly than alternatives such as tastyworks and thinkorswim®, and could be overwhelmed by the extensive suite of tools on offer.